Get an extra $10.00 off on your order of Quicken Deluxe, Premier or Home & Business pc versions with this instant offer. Just follow the above link to hit the exclusive deals page that will drop the sale price down to $59.99 (the discount automatically applied). This offer is expected to last through to the end of the month. Just Released! 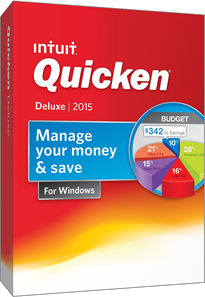 Find Quicken Deluxe 2015 at Amazon! As one of our favorite stores to buy any of the Quicken or QuickBooks software lines, Amazon now has Quicken Deluxe 2015 on sale. You should also see the offers now available on the outgoing 2014 version as you can pick up a copy for up to 40% over the listed retail price. You will also enjoy free shipping and instant download available on most versions. No special offer code is needed for this offer but just keep in mind that the sale prices will vary amount the product or versions that you end up choosing. Get Mint Free! Manage all of your finances free at Mint.com! If you spend more time in front of the iPad than you do your computer, then Mint.com may be your best option to track and manage your finances. Not only is it a free service from the same makers of Quicken software (Intuit), but you’ll have access to the all your finances on the go from any internet connected tablet, smart phone or computer. You can also sync up your online bank and credit card account into a single hub to be able to see your entire financial standing anytime, in real-time. See Mint.com for full details. Get $40.00 With the Quicken/TurboTax bundle deal at Staples. This is by far the most popular bundle deal of the tax season: Get a free $40.00 gift card on top of the already low sale prices at Staples when you buy a copy of Quicken Deluxe along with your order of TurboTax software. Just check out the deals page to see which versions will qualify and download the required rebate form (you’ll need to send it in by mail to request the gift card). Because some of the standard versions of Quicken software are priced at or below $35.00, it’s like getting a copy for free. Learn more on which versions will qualify for this offer. This deal will expire on April 15, 2014. There’s always a good time to organize and shore up your finances. If you’ve tried it on your own before and failed, you may consider Quicken Deluxe to help you succeed this time. The hardest part of achieving financial goals might be a good plan and a habit. Deluxe version can help you in both areas by easily and quickly sorting all your financials in one place delivering a clear big picture. This creates a one-place stop to check out how you’re doing and let’s you set up all types of reminders to stay on top of your money going in and out of your accounts. Your accounts can be grouped into categories such as banking, investing, and debt. You have various tools that can present this data using graphs or charts. One of the biggest benefits this software offers is Spending section. There you create categories on which you spend money that are automatically updated every time you import data. That on its own is a powerful control tool and you can easily track how much you spend vs. earn, compare different accounts expenditures over time and even set up budgets for individual categories. Details can be hammered out in Planning portion of the software that can eventually translate into saving plans. Adjust any category as you wish to put a cap on current spending. That feature on its own will help you better plan for things that really matter to you. Additionally you can set up bill payment reminders, automatic bill payments, and experiment with debt repayment. See how much in interest you can save and how much faster repay your obligations if you increase your payment. Deluxe plots that information and all other bills you pay together with your money coming in for a clear visual presentation of your cash flow.